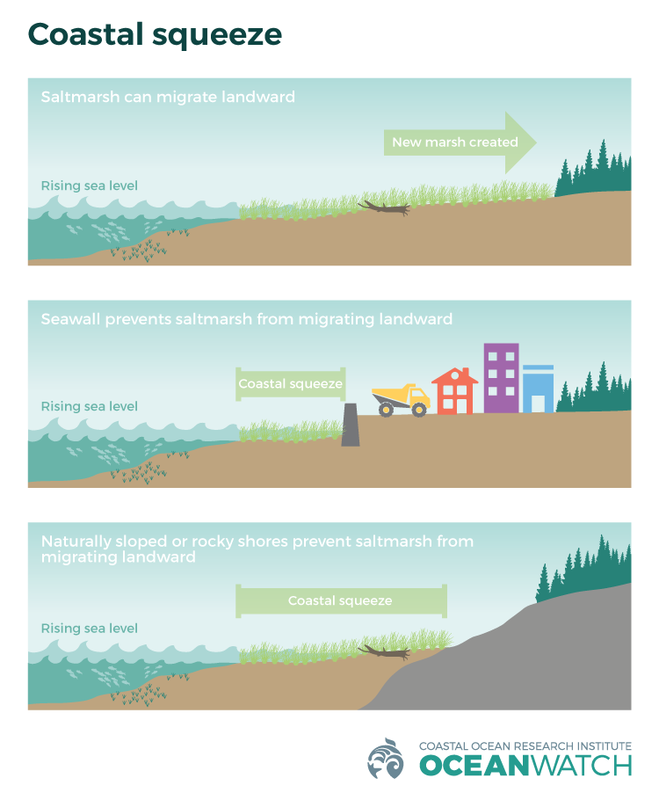 Armoring of Howe Sound’s shoreline puts homes, businesses and ecosystems at risk from ocean levels rising due to climate change. Research and education in Howe Sound has started but change is slow. The Green Shores approach can be useful, restoring coastal areas to a more natural state, using vegetation to reinforce coastal areas to preserve aquatic ecosystems, preventing erosion and protecting communities. Howe Sound can look to its neighbours for inspiration. 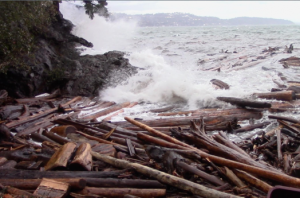 The District of West Vancouver in collaboration with the West Vancouver Shoreline Preservation Society pioneered shoreline enhancement projects in 2006 that continue today and include construction of offshore reefs to dissipate storm wave energy and enhance beaches. The Green Shores Gold-rated project for the restoration at Jericho Beach in English Bay won the City of Vancouver’s 2014 Urban Design Awards in Landscape, Public Space and Infrastructure. The District of Squamish Integrated Flood Hazard Management Plan includes some long term sea diking options that follow the Green Shores approach. 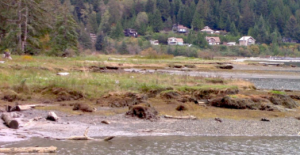 Shorelines in Howe Sound are critical habitat for diverse species and include the immediate upland, intertidal zone and shallow marine waters of rock shores, gravel and sand beaches, and marsh and fine sediment of estuaries. Like other shorelines around the Salish Sea, they have been greatly modified since the arrival of European settlers in the early 1800s. Shoreline forests were cut and cleared, estuaries diked and drained, stream flow changed by land clearing, and intertidal zones modified and sometimes polluted by settlements and industry. More recently private homes, docks, and shoreline alteration have proliferated and, looking forward, major shoreline residential and industrial developments are proposed. Against this backdrop of historic shoreline modification, sea level is rising as our changing climate causes oceans to warm and expand, and glaciers to melt, adding water to the oceans. Climate change-driven sea level rise results in a steady and irreversible movement of the natural shoreline landward, punctuated by storm surges that produce coastal flooding and erosion. The B.C. Government has advised local governments to plan for a rise in sea level of one metre by 2100 and two metres by 2200, though some climate scientists have recently suggested a “several metre rise in the next 50 to 150 years” is possible. The potential impacts of sea level rise are large: increased risk to coastal infrastructure, including increased maintenance and repair costs, loss of property due to erosion, loss of cultural and historical sites, saltwater intrusion into coastal aquifers, and loss of habitat and reduced biodiversity. Costs of adaptation are high; an estimate for Vancouver and surrounding communities is $9.5 billion over the century. 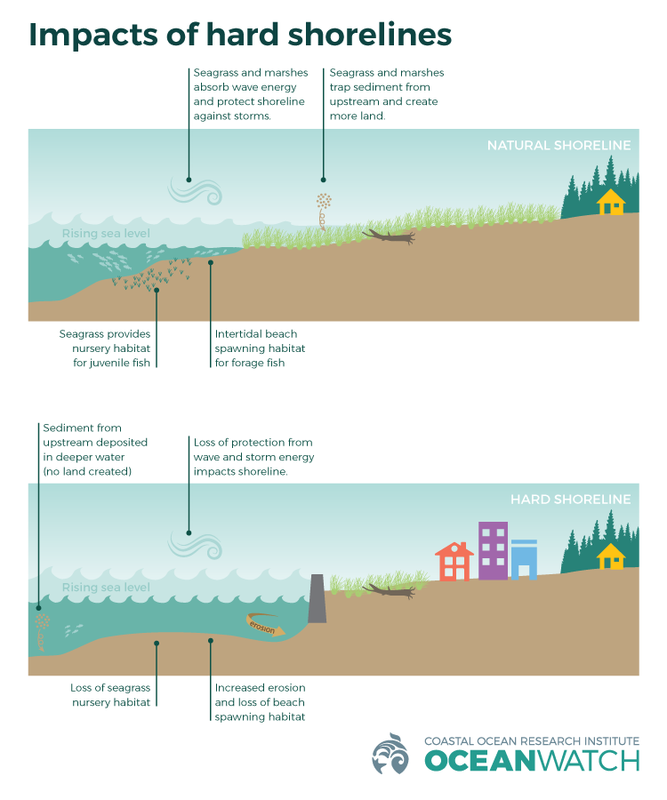 Possible responses to sea level rise in developed areas include shoreline armouring, allowing water in and adapting to its impacts through landscape design and building modifications, and abandoning the land and retreating inland. Twenty-two percent of the shoreline of Keats Island is classified as soft, susceptible to erosion, and vulnerable to sea level rise. Figure 3. Shoreline types for Gambier and Keats Islands in Howe Sound. Note that neither of these islands has bluffs. As part of a shoreline mapping project, the Islands Trust published a series of shoreline maps for Keats (2013) and Gambier Islands (2011) showing shoreline type, dominant direction of wave energy hitting each island, the locations of streams that supply sediment to the shores, estimated direction of local sediment movement, and vulnerable and valuable areas. The maps illustrate the sediment supply that is critical to maintaining beaches and estuaries in the face of rising sea levels. 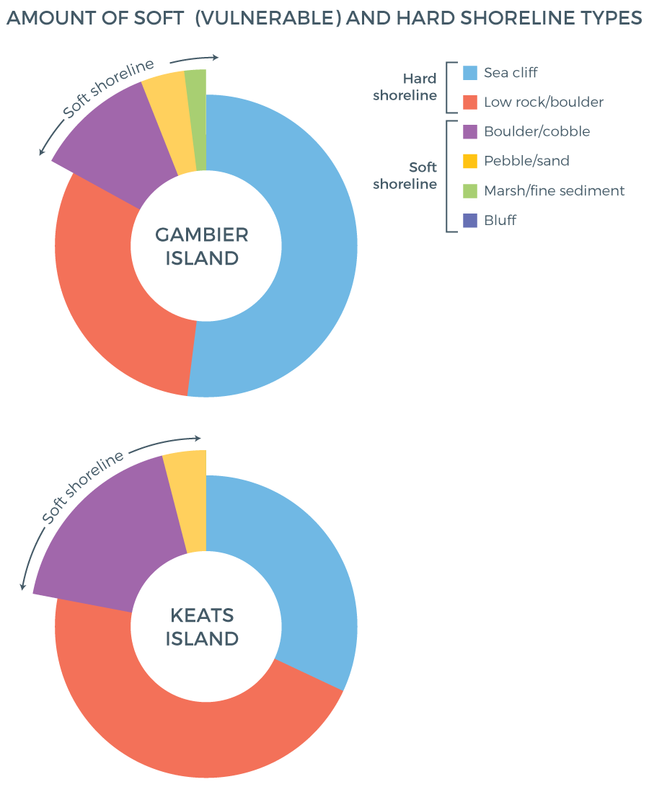 Mapping project results show that Keats Island has a slightly larger percentage of soft shorelines (Figure 3), which are vulnerable to erosion and most of which are also associated with high recreational value and high ecological value (e.g., pocket beaches and estuaries). Gambier has some “low lying areas” mapped as particularly vulnerable to sea level rise. Traditional “hard” engineering solutions to armouring shorelines with seawalls or riprap can produce unintended consequences such as increased erosion or damage to shoreline environmental habitat. “Soft” shore armouring includes addition of imported sand and gravel (i.e., adding like material to the beach such as sand and gravel to reverse the changes that often occur with hard armouring), dune and wetland construction, shore vegetation preservation or restoration, and construction of near shore reefs. Beach shorelines prone to erosion and inundation by sea level rise are very amenable to Green Shores soft alternative armouring. Fortunately, this “soft” approach promoted by Green Shores has been found to be more cost effective than traditional “hard” engineering solutions, reducing costs by 30 to 70 percent, while also producing much better environmental outcomes for shorelines. Learn how to care for your shoreline. The Islands Trust has a rich suite of resources on their website. Check out this site for further tips and to enroll your project with Green Shores. As a waterfront homeowner, trees are your best defense against erosion. They stabilize slopes with their roots. Trim or limb, rather than remove, to maintain your views. Think twice about sea walls; work with nature instead. Use Green Shore approaches for protecting and enhancing public shorelines in communities.